Item Number: 110-9-26 16735 Actual Weight: 13.5 lbs. Hard surface protection tape is perfect for protecting wood, natural stone, ceramic and other hard surfaces from scratches, abrasions, dirt, dust and paint overspray. 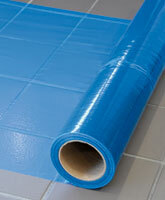 Reverse wound transparent blue tape is great for use in high traffic areas. Use with our floor protection tape dispensers.